We had left the responsibilities of our pets behind, as we headed off on a carefree couple of weeks, or so we thought. These little cuties had other ideas though. 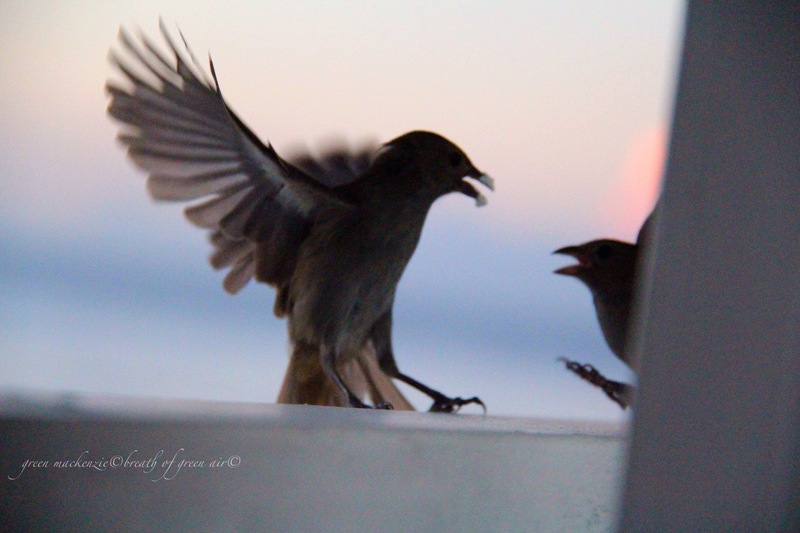 Every morning about half an hour after sunrise they would tweet impatiently on our balcony. They were looking for their breakfast of powdered coffee creamer. We didn’t understand this the first morning, and so as soon as I opened up the balcony one flew in and perched on the kettle. He nipped down and pinched a sachet, dropping it at my feet as a subtle hint. He soon had me well trained, and would bring me a gift of a small twig, with all but a couple of leaves plucked off it, as a reward. He would place this in front of me, and then wait patiently until I picked it up. He also defended his spot fiercely whenever another boy tried to perch on my balcony. He moved so fast, that it was hard to get a clear shot, and for the first few days he was very wary of the camera whenever I reached for it. I only hope that next guest in our room is as easy to train as we were. It was such a lovely way to wake up in the morning, sipping coffee to the sound of birds and soft waves….. 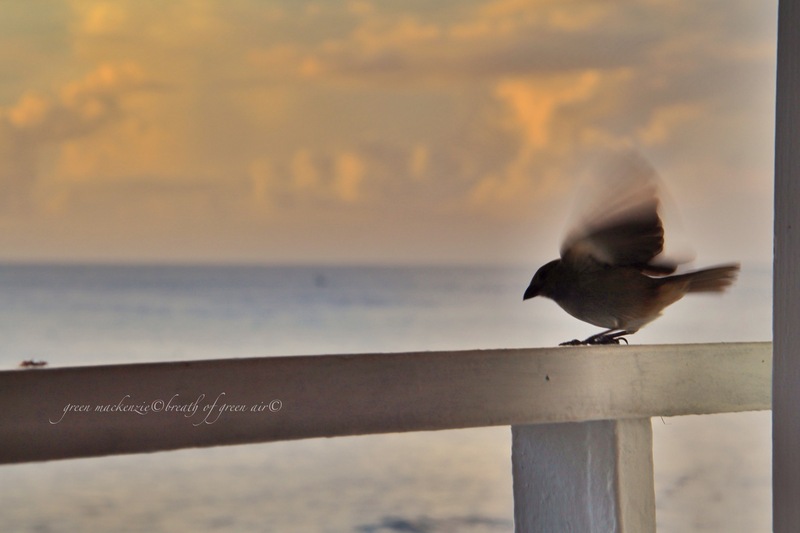 This entry was posted in nature photo, relaxation, weekly photo challenge and tagged birds, Carribean, mindfulness, morning, nature, photography, postaday, relaxation, travel, wings. Bookmark the permalink. How sweet……..tiny little chirpers, waiting for their breakfast. As much as we look forward to holidays, leaving the animals is always bittersweet and we find ourselves drawn to other people’s pooches. Usually a quick cuddle (after asking, of course!) helps. Nice you had these magical friends to visit each day and keep you connected………..
Powdered coffee creamer! Who would have guessed?? Beautiful shots of the clever birds! Oh my look at the comments!! We’re all so excited that you had such a wonderful holiday, and came home with lovely stories to share! I smiled throughout the reading of this post! And I do so hope you’ll tell me how you captured the motion of these wonderful images. I’ll look forward to more!! Love the flapping wings; lovely capture. What a marvellous experience. I love that the wee bird bought you a gift. 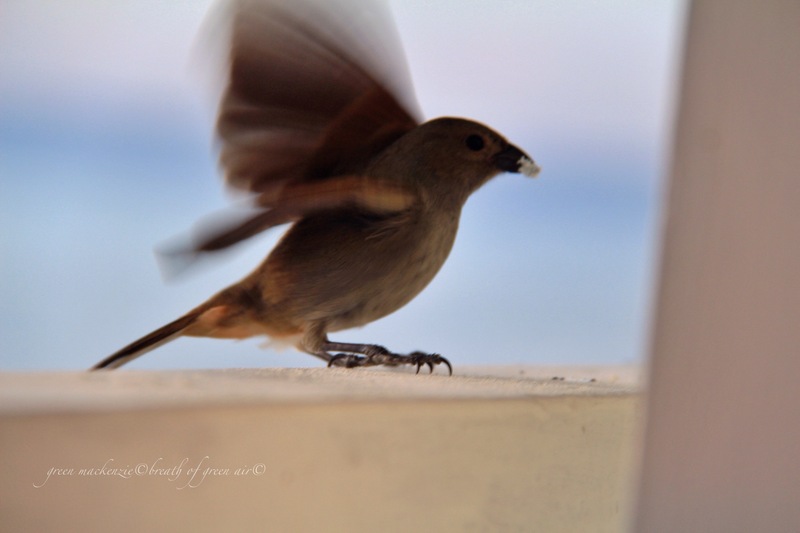 Your photos are gorgeous…..those out-stretched wings look so fine yet are so strong. The Tui haven’t begun to tap on the window yet but they do look over their shoulder towards the house when the feeder is empty. The Tiu will soon get you trained I’m sure. I have always felt that birds are incredibly intelligent, but these lovely cuties have proved that to me now beyond any doubt. They were watching me as much as I was watching them….and the little twig gifts were incredible…. Tui in captivity often mimic words so any day now I could be getting a message one way or t’other. I talk to them and whistle (pitifully!) to them. A fellow blogger once said “there is nothing bird-brained about birds” and she is very correct. Lovely motion blurs. 🙂 I also like the first image best…great composition, interesting sky, nice movement in the wings. Of course it would choose you Seonaid! These pictures are beautiful. My favourite is the first you have shared. Thanks Colline, the soft colours of the early morning light were wonderful, and once the birds trusted the camera I caught some lovely shots. What a delightful story! Enchanted. It really was Sue. Just being by the sea and hearing the waves puts me in heaven, but adding in cute birds is ridiculously close to perfection…..missing them already!